Air Void Analysis according to ASTM C457 or EN 480-11. Examples of polished plane sections with the PetroPlaner. Above left is a surface prepared for air -void analysis using the RapidAir system according to ASTM C 457 or EN 480-11 after contrast enhancement. At center and right are examples of surfaces prepared for forensic, petrographic analysis. In preparing polished plane sections for microscopical air-void analysis according to ASTM C457 or EN 480-11, it is crucial that the polishing be of very high quality. Both the paste and the aggregates have to be polished to exactly the same level and no erosion of the paste has to occur. In order to measure reliably the correct chord length of each air void, it is extremely important that the individual air voids have clear and sharp edges without any degradation. Otherwise, the results of the air-void analysis will be erroneous. The PetroPlaner grinding system, with its different grinding slurries, maximizes the success of such grinding and polishing jobs. The procedure can be supplemented by impregnation with an acetone based hardener that is applied before each grinding step. 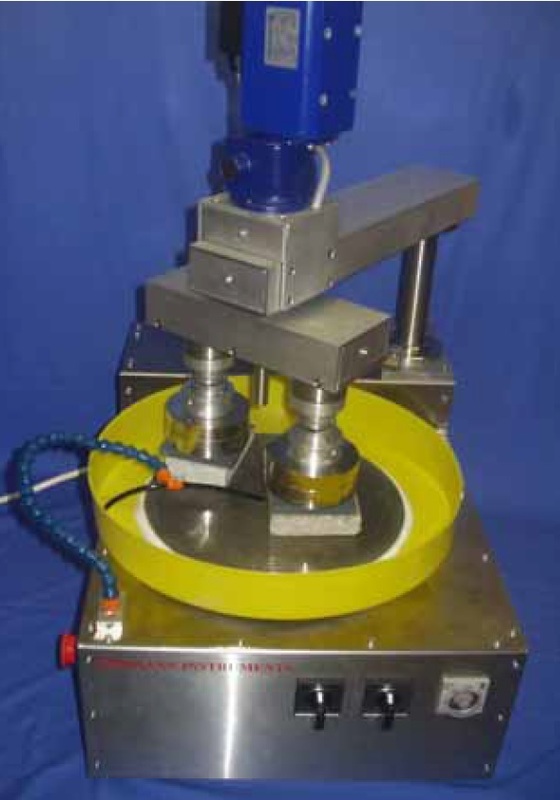 The grinding technique involves three rotating parts: the specimen itself, the transverse arm connecting the two specimens, and the rotating table. This novel grinding system ensures even grinding of the specimens and even wear of the grinding surfaces. The above photo shows the complete PetroPlaner unit. Shown on the right are details of the attachment to the two specimens and the built-in self-feeding and recycling system for the grinding slurry. 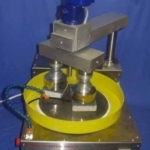 The specimens rotate eccentrically in relation to the rotating cast ion bottom plate with the grinding or polishing slurry in between. 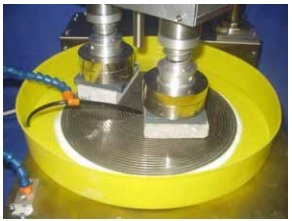 Grinding and polishing takes place using selected slurries with varying fineness of silicon carbide particles. The typical specimens are 150 mm by 150 mm in polishing area and 40 mm in thickness. The PetroPlaner requires access to 380 VAC and to cold water. The PetroPlaner is supplied with different silicon carbide (Carborundum™) powders for grinding and polishing. Also required are: a diamond saw, equipment for vacuum impregnation, a fume hood, and a drying oven. 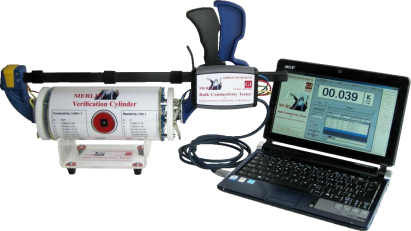 Germann Instruments will provide all the necessary additional equipment upon request as well as assistance in setting up the PetroPlaner and technician training. 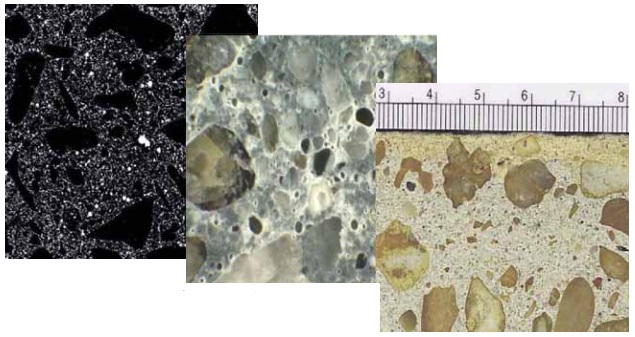 We also provide courses in concrete petrography using macroscopic examination and optical microscopy.